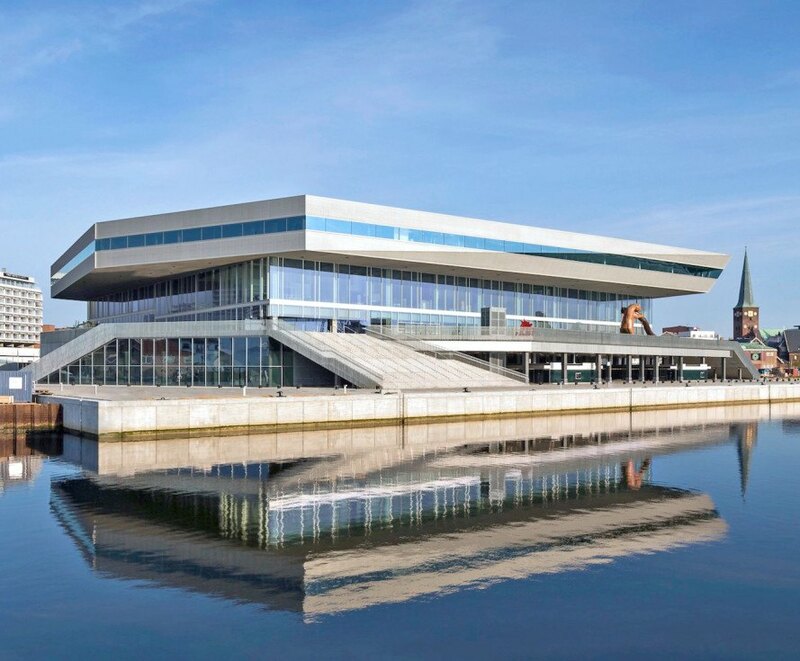 Scandinavia’s largest public library opens its doors on June 20. Powered by solar energy, Dokk1 is a modern structure designed by schmidt hammer lassen and built as part of the Urban Mediaspace project in Aarhus, Denmark. The 30,000-square-meter building is the largest construction project ever completed by the Municipality of Aarhus. Designed to meet the Danish 2015 energy classification, Dokk1 was completed for a budget of over €280 million. Schmidt Hammer Lassen won the bid for the project after placing first in a 2009 design competition. The energy-efficient polygonal library is but one of many libraries completed by the Danish architecture firm; their portfolio includes the RIBA award-winning University of Aberdeen New Library in Scotland and the extension to the Royal Library in Copenhagen. Located at the mouth of the Aarhus River, Dokk1 will serve as a major urban hub that reconnects the city with the harbor. The building is comprised of three parts: the geometric top floor with the municipal offices and rental offices; the multi-story glazed section housing the library; and an elevated podium that overlooks the harbor. The project will also include a citizen service center, automatic parking for 1,000 cars, new harbor-side public squares, new cycle paths, over 450 bicycle parking spaces, and a dedicated light railway station. The expanded metal facade is folded and angular to reflect the scale of the surrounding buildings and harbor elements, such as the cranes and ships. “Dokk1 is not simply a building,” says Kim Holst Jen-sen, Senior Partner at schmidt hammer lassen architects. “It is a place for exchanging knowledge and opportunities and a multicultural meeting point that will change people’s perception of the entire city. Dokk1 enhances this special setting with an architecture that creates an exceptional visual connection to the city – both from inside the building and out. 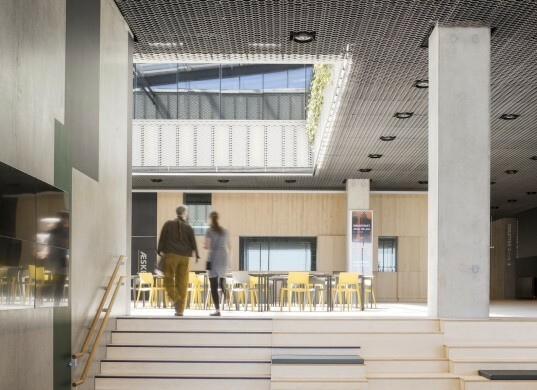 Through this, we form an icon for the knowledge society, an icon that supports and stimulates creative collaboration.” Dokk1’s interior encourages collaboration through its open layout and visual connections to the different building programming and outdoors. 3,000 square meters of solar cells top the library’s roof. Designed to meet the Danish 2015 energy classification, Dokk1 was completed for a budget of over €280 million. Schmidt Hammer Lassen won the bid for the project after placing first in a 2009 design competition. The energy-efficient polygonal library is but one of many libraries completed by the Danish architecture firm. Their portfolio includes the RIBA award-winning University of Aberdeen New Library in Scotland and the extension to the Royal Library in Copenhagen. Located at the mouth of the Aarhus River, Dokk1 will serve as a major urban hub that reconnects the city with the harbor. The expanded metal facade is folded and angular to reflect the scale of the surrounding buildings and harbor elements, such as the cranes and ships. The project will also include a citizen service center, automatic parking for 1,000 cars, new harbor-side public squares, new cycle paths, over 450 bicycle parking spaces, and a dedicated light railway station. The building is comprised of three parts: the geometric top floor with the municipal offices and rental offices; the multi-story glazed section housing the library; and an elevated podium that overlooks the harbor. “Dokk1 is not simply a building,” says Kim Holst Jen-sen, Senior Partner at schmidt hammer lassen architects. “It is a place for exchanging knowledge and opportunities and a multicultural meeting point that will change people’s perception of the entire city." Dokk1's interior encourages collaboration through its open layout and visual connections to the different building programming and outdoors. 3,000 square meters of solar cells top the library’s roof.